This site is also about other work that I like and think you might be interested in. Joe Corroney has done a tremendous amount of Star Wars related illustration work, as well as other genre focused stuff. You can see a lot of his work on his website. 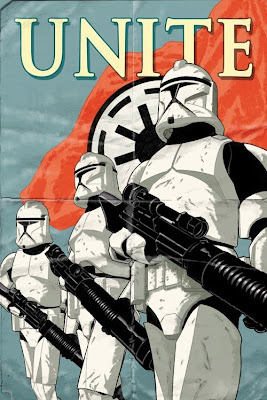 He just finished a series of Star Wars related propaganda posters that I thought were very cool. You can purchase posters on his site as well. They're a bit steep cost wise in my opinion, but the work is cool.